After receiving the Ph.D. degree in 1975, Dr. Jones went to work for the Montana Energy and MHD Research and Development Institute as a Sr. Systems Analyst. He joined the Kansas State University Mechanical Engineering Faculty in 1978 and has continued as a faculty member since that time. At K-State, Professor Jones has held several positions including Head of Mechanical and Nuclear Engineering, Associate Dean for Research and Graduate Programs, Director of the Engineering Experiment Station, Director of the Institute for Environmental Research, and, his current position, Director of the National Gas Machinery Laboratory. Dr. Jones has been a registered professional engineer for 39 years. After receiving the Ph.D. degree in 1975, Dr. Jones went to work for the Montana Energy and MHD Research and Development Institute as a Sr. Systems Analyst. He joined the K-State Mechanical Engineering Faculty in 1978 and has continued as a faculty member since that time. 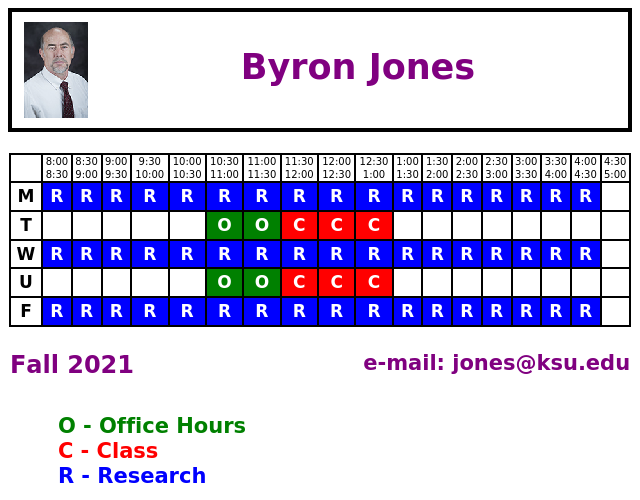 At K-State, Professor Jones has held several positions including Head of Mechanical and Nuclear Engineering, Associate Dean for Research and Graduate Programs, Director of the Engineering Experiment Station, Director of the Institute for Environmental Research, and, his current position, Director of the National Gas Machinery Laboratory. Dr. Jones has been a registered professional engineer for 39 years. Dr. Jones is the author or editor of chapters in four engineering handbooks, the author of chapters in other technical books, the author of one textbook, and the co-author of a second book. He has authored countless journal and conference papers. He is a member of the Society for Automotive Engineers, a Life Member of the American Society of Mechanical Engineers, and a Fellow and Life Member of the American Society of Heating Refrigerating and Air Conditioning Engineers. He has served as a Distinguished Lecturer for both ASME and ASHRAE giving lectures at approximately 40 local chapters. He is the recipient of the Louise and Bill Holladay Distinguished Fellow Award, the Standards Achievement Award, and the Ralph G. Nevins Award all from ASHRAE. He is also the recipient of the College of Engineering Research Excellence Award at KSU. He has supervised 41 M.S. and Ph.D. students.